This week, we'll be talking about something that's always been a long-standing problem. Yep, where to eat fast food. "Hindi, masmasarap ang Big Mac!" "Anong Aloha, Aloha? Quarter Pounder yata, mas-sosyal!" "Ah Basta! Jollibee pa rin ako!" "Aba bahala ka! McDonald's pa rin!" Well folks, argue no more. 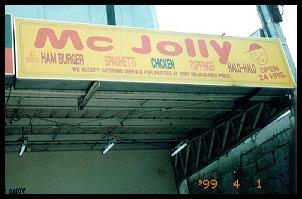 An enterprising enterpreneur in Sucat has just come up with the solution to all your fast food problems. Now, you no longer have to worry about which fast food joint is better. You can have a Big Champ, a Regular Yum Pounder, and a Peach-Mango-Apple Pie! So whatcha waiting for? Come on in!